Talking about exotic Soul records: this is a drawing that Willem Vleeschouwer once made for me after I played him the LP by the Surinam band The Falling Stones. I am a huge fan of soul music made in exotic countries like Barbados, French Guyana and Caribbean islands. Since Holland once had some colonies in that area, there are quite some nice records to be found here from counties like Surinam and The Antilles. And some of these records are real good! I have done some searching into this forgotten or overlooked territory of the music world, and in this Soundtrack I will share with you some of the highlights. The LP of The Falling Stones is definitely one of them. It has all the qualities that make exotic soul records worth hunting for: a singer with a tropical accent, texts that no American could ever write, and great musicians that can barely control themselves knowing that this recording is their claim to fame. 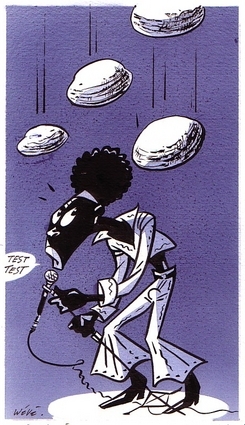 One of the three lead singers of The Falling Stones was Louis Windzak, nicknamed The Surinam Otis. On the LP, which is a private release (with no date on it, but I guess it is from 1972 or so) are half covers, half original songs. Bands like these were often outstanding live acts, playing on the many Surinam festivals for large crowds. Also did (and still do) these bands often back up American soul singers, who tour Holland without a band of their own. Some of these concerts are legendary. There are some bootlegs on the market that make you wish you had been there too.